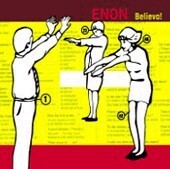 Lazyeye Review: Enon -- Believo! The mad musings of Brainiac's John Schmersal and Skeleton Key's Rick Lee and Steve Calhoon has a beating heart under a thick mucilage of distorto electronica. For a CD that's only about a half-hour long, you get five really solid tracks out of 11. It's unfortunate that "Rubber Car," with its Beck-style falsetto, leads off. I realize that Schmersal did something like this first with Brainiac, but this sounds like it's right off Midnight Vultures and is no way indicative of things to come. "Conjugate the Verbs," lulls you in with its tree-frog-like synths and Schmersal's nerdy vocals before it bludgeons you about the head and shoulders with pounding drums and bass like a clumsy, stumbling drunk. "Believo!" is a sleek, black Mercury cruising the strip at midnight, looking for trouble or a good jazz club. "Come Into" sounds like an old World Party song forced through an electronic food processor, sweet and distorted with a solid, shuffly beat. "Get the Letter Out" and "World in a Jar" have that Sunday-in-the-park British chime-pop feel a la XTC's Oranges & Lemons -- pretty straight forward, if a bit boring. The rest relies a wee bit too much on samples, found sounds and percussion in an effort to raise your eyebrows, resulting in a mish-mash of noise that takes away from the basic melodies. Time: 32:46.
back to Published in The Omaha Weekly June 8, 2000. Copyright © 2000 Tim McMahan. All rights reserved.